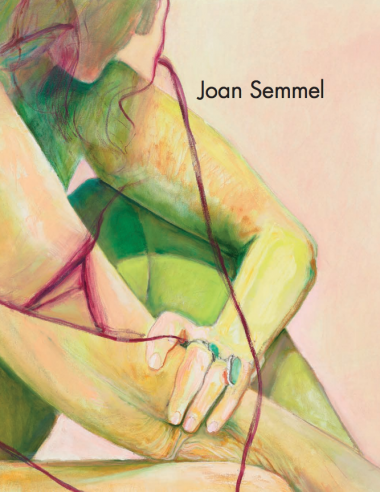 Since 1974, Semmel has focused on her body as subject, beginning with her “Self-Images” series, in which she radically shifted the perspective of her compositions to capture an enhanced sense of intimacy. 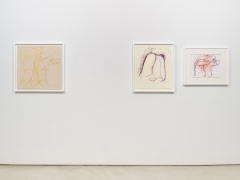 In her new work, she combines conceptual and formal concerns echoing many of her previous investigations. 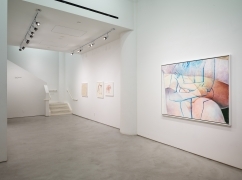 In her recent paintings she applies saturated abstract colors in a variety of styles; sometimes in linear strokes, others in flat swathes of pigment. Her command of a broad painterly language and predilection for vibrant hues emerges from her early training in abstract expressionism. 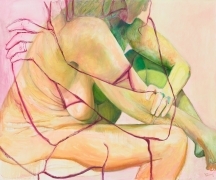 Rooted in her belief that “a unified style is not preordained,” Semmel pushes beyond traditional notions of scale, as well as color, as shown in Crossed Limbs (2016), in which she depicts her figure in naturalistic tones, and crops the composition to the point that the forms of her body become a landscape. 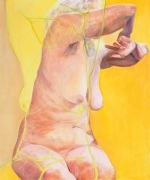 In Blue Embrace (2016), her depiction of close-up images and active use of foreground space emphasize the freckles and wrinkles of her own flesh, suggesting skin as both evidence and metaphor for age, but also as a decorative patterned surface which firmly situates the object as painting. She continues to use the camera as a tool in her studio process. In Flesh Ground (2016), Semmel layers in vivid green and pink two separate images of herself, both adapted from photographs. 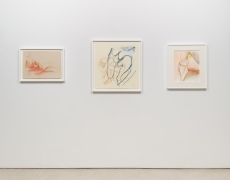 The superimposed images visually interact, often appearing to envelop each other, creating what Semmel describes as “dialogues within each painting [which] entices the viewer to engage.” In her new works, the visual embrace of self communicates protection as well as an intimate comfort with her own body and identity. In Step Out (2016), Semmel doubles the image as a means of expanding both the background and foreground of her compositions so that her figures appear to simultaneously enter and draw back from the viewer’s space.